LeBron James takes aim at the broad side of an apartment building. By the time LeBron James finished his eighth NBA season in 2011, he’d amassed quite the résumé: two MVP awards, two NBA Finals runs, five first-team All-NBA nominations, a scoring crown, three All-Defensive Team nods, seven All-Star Game appearances and — why not? — a Rookie of the Year win, too. But despite all the accolades, James’s skill set wasn’t quite maxed out. To that point in his career, LeBron’s lifetime 3-point percentage was well below the NBA norm, and he’d never shot better than league-average in any season of his career. It was proof that even a legend in his prime has room to improve in some aspect of the game. And to James’s credit, his deep shooting did get markedly better starting in 2011-12 — perhaps not coincidentally, the year he won his first NBA championship. 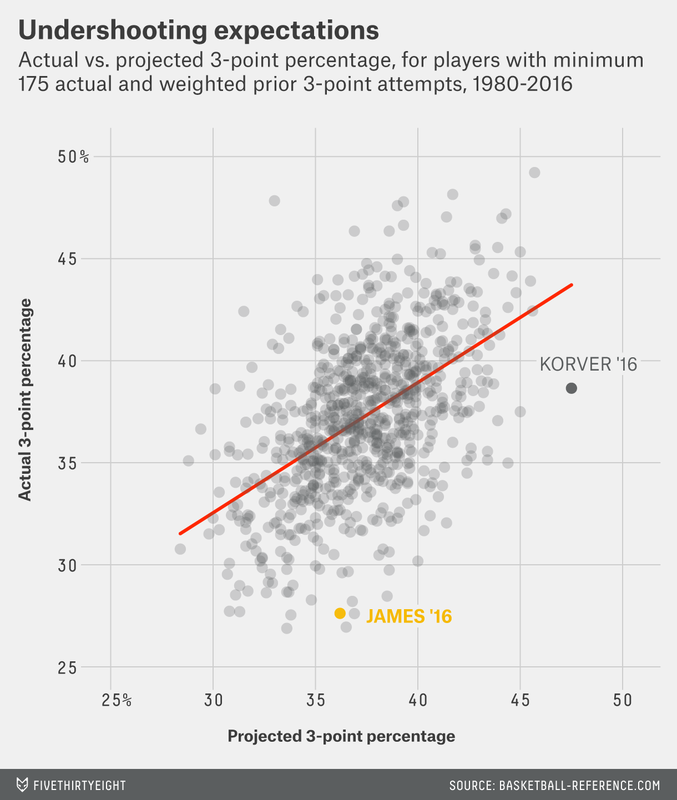 Whereas James’s career 3-point accuracy was 2.9 percentage points below average going into that season, it zoomed to 2.1 points better than average over the next four seasons. Put another way, James essentially went from the bottom quartile of NBA 3-point shooters over his first eight seasons to the top quartile over the next four. When a guy who was already unstoppable going to the rack also forces defenses to respect him on the perimeter, well, you remember what happened. Remarkably, James’s mid-career shooting improvement wasn’t simply the result of spot-up gimmies created by the Miami (and, later, Cleveland) offensive machine, either. In 2013-141, over half of LeBron’s 3-point attempts were pull-ups; in 2014-15, that figure was up to nearly 60 percent. Pull-up 3s are notoriously difficult shots, but James made them at a high enough clip that the image of him stepping into a long jumper from the wing — the most imposing figure in the league just sort of sauntering into place, squaring to the rim, then rising straight up with all the artfulness of a tower crane, and canning it — became one of the signature plays of these past few NBA seasons. That improved jumper paved over one of the last imperfections of an already near-perfect player, and the full actualization of LeBron resulted in some of the highest-level basketball ever played. Fast-forward to this season. LeBron is still playing elite ball (even if he is no longer the game’s best player), but a curious thing has happened to that improved 3-point shot: It’s vanished. And I mean into thin air — James’s 27.6 percent accuracy from the outside is easily on pace to be the worst mark of his career. Instead of maintaining his freshly discovered marksmanship from downtown, he ranks 16th-worst among qualified 3-point shooters this season. For all the narratives about James’s evolving skills over time, his long-range shot has unexpectedly gone right back into the gutter, practically overnight. This kind of abrupt drop-off does happen from time to time, but not often. Going into the season, Basketball-Reference.com’s simple projections called for James to make 36.2 percent of his 3-pointers, a mark he’s currently missing by 8.6 percentage points. Since the NBA introduced the 3-pointer in 1979-80, 822 players have entered a season with as large a sample of prior 3-point shots2 as James while also firing off as many attempts during the season being projected; only 10 (1.2 percent) have missed their expected mark by a wider margin than James’s current shortfall. Granted, one of those players is Atlanta’s Kyle Korver, who has fallen 8.8 percentage points shy of his projection this season. (Fun note: Korver’s definition of a “disappointing” 3-point percentage is still 3.4 points higher than league average.) Historically speaking, we’d expect only one NBA player to experience this type of shooting slump once every two or three seasons, but the 3-pointer’s ever-skyrocketing frequency gives contemporary players more chances to join this sample — and to underperform their expectations — than players of a generation ago. So what’s causing James’s sudden regression behind the arc? It certainly isn’t an increase in long-range volume. His 3-pointers make up a smaller share of his total shots now than they did a season ago, bringing that proportion more in line with what it was in 2012-13, when James knocked down a career-best 40.6 percent of his 3s. Nor is it a matter of location. 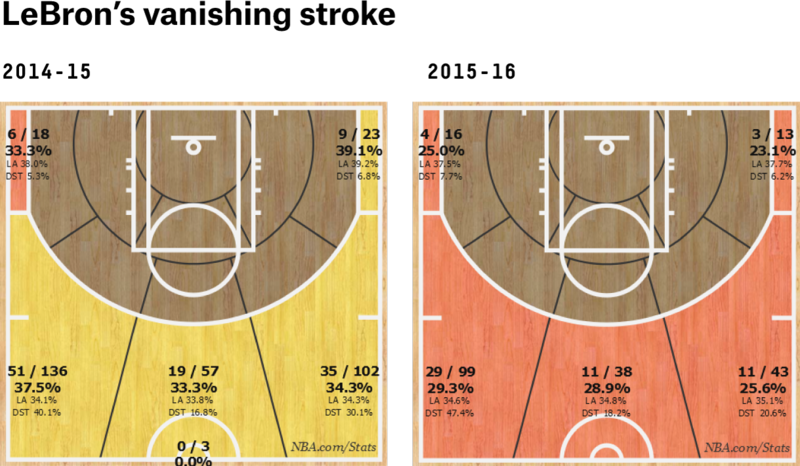 We would actually expect James’s conversion rate to be marginally better this year based on the distribution of his 3-point attempts by zone; he’s shooting slightly more of the shorter, easier variety of 3s that reside in each corner of the court. Amazingly, the culprit for James’s declining percentage doesn’t even appear to be the circumstances under which he’s had to shoot. Last season, James had the benefit of an assist on only 46.7 percent of his 3-point baskets; this year, that rate is much higher, at 62.1 percent.3 Somewhat relatedly, James also shot more pull-up 3s last season — you know, the ones only Steph Curry can turn into a workable offensive strategy. This year, he’s shifted about 11 percentage points’ worth of those4 into 3s of the much easier catch-and-shoot variety. And a smaller share of James’s 3-point attempts this season have come in difficult shot clock territory — categories marked by NBA.com as “Late” or “Very Late” — or against tough defensive pressure — classified by SportVU’s tracking cameras as “Tight” or “Very Tight” — than last season. In other words, practically every statistical indicator says James should be shooting the ball better this year, not worse. An already improbable downturn is made all the more baffling by the lack of a logical explanation — with all of our data and technology, we’re supposed to be able to dissect and diagnose cases like this. James quantifiably has more space and more time, and he even says he feels significantly better than he did last season, but the shots are simply not falling. Somehow, James has managed to make that formula work for him. Cleveland ranks fourth in offensive rating, and LeBron has individually maintained the league’s third-best offensive Real Plus-Minus despite the wayward perimeter shooting. Perhaps that shouldn’t surprise us much — after all, a younger James’s production was off the charts before he ever developed a credible long-range jumper. At the very least, it suggests the Cavs might be able to capture another Eastern Conference crown even if James doesn’t miraculously regain his touch from the outside. But as far as statistical puzzlers go, James’s inexplicable shooting collapse is one for the history books. Even in the modern age of advanced basketball metrics, sometimes we have to deploy the analytic equivalent of a shruggie. The first year for which we have SportVU data. In terms of the weighted sum of his attempts over the previous three seasons. There is no data available on how many of his misses would have been assisted. As well as tries that don’t fall into either bucket.